Architect Kengo Kuma, designer of the "stadium of trees" that will serve as the 2020 Tokyo Olympics and Paralympics main stadium, said he was familiar with the environment around the planned construction site as he walks around the area almost every day to commute to his office. Kuma, 61, told the Mainichi Shimbun, "As my office is close to Meiji Jingu Gaien and I knew the environment there, I wanted to create a stadium that would match the environment. I created the design in which people would feel themselves surrounded by trees while watching sports." In the stadium designed by Kuma, plenty of wood is used in harmony with the surrounding environment and a Japanese-style lattice is adopted to rebuild Japanese tradition in a modern way, with special attention given to plants. Kuma, born in Yokohama, graduated from the University of Tokyo. When he was an elementary school student, he was moved by the Yoyogi National Gymnasium built for the 1964 Tokyo Olympics. Shunsuke Kurakata, associate professor of architectural history at Osaka City University, said, "Mr. Kuma has a reputation for his skills to create architectures by flexibly responding to requests from clients. The adopted proposal lacks impact, but it makes us feel a 'matured Japan' and the stadium which blends into surrounding green fits into the social awareness of today." 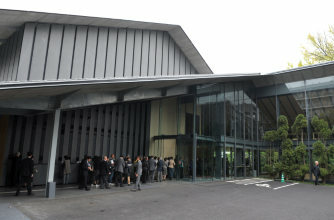 Kuma's notable works include the Nakagawa-machi Bato Hiroshige Museum of Art in Tochigi Prefecture and the fifth and current Kabuki-za Theater in Tokyo. He won the Mainichi Art Award in 2010 for designing the Nezu Museum which was built in 2009. Kuma also enjoys a high international reputation as an architect. In an interview with the Mainichi some time ago, he said, "The times demand architectures that comfort people, and natural materials are suitable for them."